Thursday morning was bright and mild – almost spring-like – and so I decided it would be an ideal time for recce’ing a short ride being organised next week for students at my local university by Sustrans. I think it’s part of the university’s Environment Week. 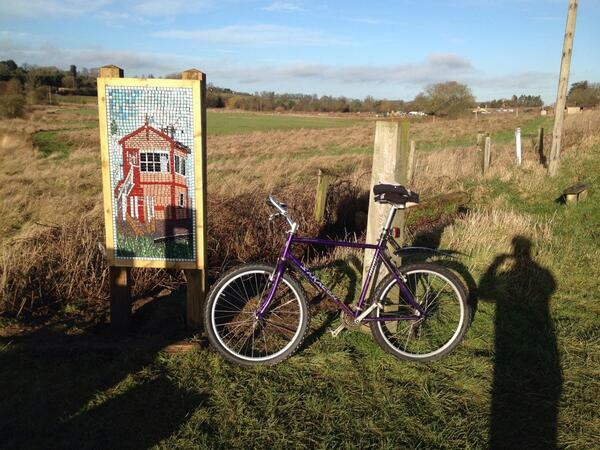 The fun part of the ride is to be along the traffic-free Brampton Valley Way (BVW). The problem is to find a safe route from the university to the BVW – and another safe route back again – for cyclists who may well be inexperienced or nervous in motor traffic. With friends John and Phil, I’d helped on a smiler ride last year but couldn’t remember the safe route back. And I have to admit that that part of Kingsthorpe (between the BVW and the Welford Road) is a bit of a mystery triangle for me. So, I started at the University and got quickly down to The Windhover where the A5199 crosses the BVW and I remembered two pieces I’d read by fellow Kingsthorpe Blogger “baptissimo”. In his blog “Searching for Lucia” he’d written about a tile mosaic erected beside the path. And then he’d found another one! So, instead of just recce’ing a safe way back, I pedalled along the BVW (We’ll be going along there with the university group on Wednesday anyway). Met three ladies; asked them; no, they hadn’t seen any mosaics. And then I did – just where the restored railway begins. A quick pedal back; chat with the three women (their dogs must have been slow); onto the BVW going south from The Windhover. What a lovely surface for that part of the Way! And then nipping through a jitty into Kentstone Close, it was a safe journey back to the University. Now the upside to all this is that Carole Miles commented on “Searching for Lucia” and identified herself as the artist. The mosaics project is called “Marking a Fine Lane” and there are some excellent photos by the splendidly named MacCanonymous here on Flickr.